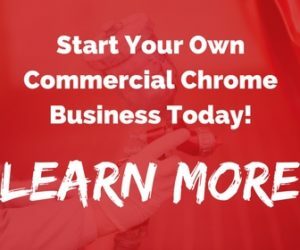 If you are thinking about ordering a PChrome spray chrome kit, but you are unsure of how to use it, there are certain tips and tricks that you can follow when you are using chrome spray paint to achieve the glorious mirror chrome luster that you want. Here is some information to help you get started. What is spray on chrome? PChrome spray on chrome is a beautiful finish that offers a superior shine to other coatings. It is very versatile and can be used on projects both large and small. You can use it on plastic to add excitement to your retail exhibits, on wood furniture to add unexpected shine during your furniture restoration project, on art pieces for drama or on more traditional items like bumpers and wheels. Whatever you want, applying the spray on chrome is straightforward so that you can get the results that you want. There are a few tips and tricks that will help you feel confident when you start working on adding spray chrome to your project. 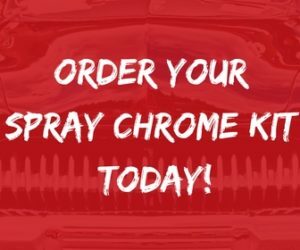 When you first receive your PChrome spray chrome kit, you can simply follow the step-by-step instructions to get the beautiful shine that you want. Before you begin, make certain to use a face mask and gloves to protect yourself. Start by sanding the surface that you plan to apply PChrome to. After roughening it, degrease and clean it by using PChrome’s grease remover and dry it off. Before you apply your base coat, make certain that you are in an area where there is a place that you will be able to set the part in order to let it cure. You’ll also want to make certain that it is clean, dust-free and well-ventilated before you start spraying. In order to apply the base coat, simply follow the step-by-step instructions that come with your diy spray chrome kit. 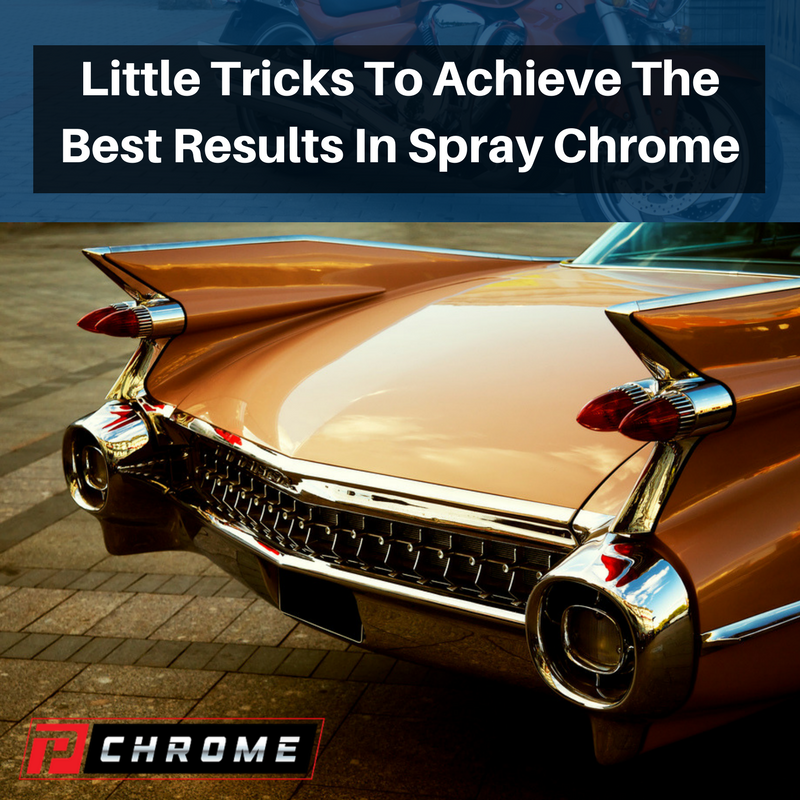 After you have mixed your spray chrome chemicals and are ready to apply the base coat, make certain that you spray it on using even, side-to-side motions. Apply it slowly to get better results, and make certain to wait for five minutes before applying the wet coat to it. Don’t allow anything to touch the base-coated item or it will show through later. You’ll want to continue applying base coat until it is smooth. Move through the four chroming steps with one immediately following the other. When your part is chromed to the desired luster, rinse it thoroughly and apply the chrome again. Then, rinse once again and blow dry the part immediately. The top coat application is your final step. Mix your chemicals according to the instructions and apply them as directed. Before applying it, make certain to allow your chrome coat to dry thoroughly. Don’t apply the top coat to parts that are still tacky. Using chrome spray paint from PChrome is fairly easy. If you follow the steps, you’ll soon be chroming items that you want effortlessly. To order your kit today, fill out your information in our online form.